Still clinging to the internet's idealistic dream of constructive engagement and discourse with friends, strangers, and robots around the world and sometimes on Mars. Academic culture is supposed to be a model of cooperation that transcends political, cultural, national conflicts. I’ve worked on joint collaborations that included American, Iranian and Israeli researchers, all working together with common professional goals. It’s supposed to be a demonstration of what we can accomplish through positive engagement. But then something like BDS comes along and tries to derail the whole project, putting political conflict ahead of academic values. The results are petty, damaging, and ultimately ineffectual. These professors are trying to change the world by withholding letters of recommendation from students who want to study in Israel. This is simply an act of sabotage against young people who depend on them but don’t share their views. Just nauseating. So far the response of the University of Michigan to this clear dereliction of duty has been tepid. I would hope that you could impress on your faculty their need to fulfill their academic duties regardless of their personal beliefs, and tell them that refusing to help students advance their careers because that help violates one’s dislike of Israel—or any other country—is not a demonstration of academic freedom, but a violation of one’s contract with the University. I would have done exactly the same thing had a Jewish professor refused to write a letter supporting a student who wanted to study in Palestine. John Cheney-Lippold, a tenured American and digital studies associate professor, will not get a merit raise during the 2018-19 academic year and can’t go on his upcoming sabbatical in January or another sabbatical for two years, according to the letter signed by Elizabeth Cole, the interim dean of UM’s College of Literature, Science and the Arts. He could also face additional discipline, up to and including dismissal, if a similar incident occurs in the future, Cole wrote in the letter, dated Oct. 3.
. . . Besides outlining disciplinary action, Cole’s letter chided Cheney-Lippold for writing two letters previously for students who wanted to study in Israel because he didn’t have tenure. Cole also criticized him for using class time in two courses he is teaching to discuss his views on the Palestinian-led BDS (Boycott, Divest, Sanctions) movement and his decision to not write a letter for Ingber. The letter also said Cheney-Lippold violated Ingber’s privacy in some statements he made to media outlets and “cast a national spotlight” on her. “Your actions throughout this entire series of events has harmed your students and has caused significant disruption to the Department of American Culture. the College, and the University as a whole,” Cole wrote. The interim dean also said Cheney-Lippold wrongly portrayed the Israeli boycott as sanctioned by UM. “In fact, the University formally and publicly opposes a boycott of Israeli academic institutions,” Cole wrote. Cheney-Lippold’s current salary was unavailable, said UM spokesman Rick Fitzgerald. But before he received tenure, he was an assistant professor earning $77,797. UM does not give cost-of-living raises, only merit raises, Fitzgerald said. Cheney-Lippold was scheduled to go on a sabbatical for one semester starting in January. I’d say that that is pretty stiff punishment; in fact, it is stiffer than I would have imagined. Canceling a sabbatical is pretty severe stuff, as you lose all that free time you could have devoted to research. But the discipline is a UM matter, and certainly what Dean Cole wrote Cheney-Lippold was fine—in line with my view that there are professional obligations of faculty that transcend personal ideology. Good for the University of Michigan! “The way he publicized everything and put his own personal beliefs ahead of the academic interests of the students and caused shame to the university and our daughter, that was sufficient basis for him to be terminated,” [Mark] Ingber said. He also said he thought that Cheney-Lippold waited until his tenure became effective on Sept. 1 to deny his daughter a letter of recommendation, calling it “manipulative” so that he would be immune to discipline. Cheney-Lippold is consulting with lawyers, and an advising lawyer (from Palestine Legal) said that Cheney-Lippold’s rights had been violated by “compelling” him to favor a program “that is fundamentally discriminatory and violates human rights.” Good luck, Dr. Cheney-Lippold, and congratulations for getting in bed with the anti-Semites. As the Post reports, it’s very similar to the Cheney-Lippold incident. Jake Secker is a 20-year-old junior from Great Neck, N.Y., majoring in economics and minoring in entrepreneurship. His father is Israeli, and Secker has made five trips to the nation he considers his “home away from home.” But since he was a young boy, he has longed for something more — actually living in Israel for a stretch of time. This winter, a semester abroad at Tel Aviv University could fulfill that aspiration, he hopes. As part of the application process, Secker sought a reference from a teaching assistant, known at Michigan as a graduate student instructor, or GSI. “I am in need of an academic letter of recommendation to study abroad next semester and if you can do that for me that would be greatly appreciated,” he explained. She replied the same day. “Totally! I’d be delighted,” wrote a teaching assistant he identified as Lucy Peterson who, according to her Facebook profile, is a political theory student at the university. Secker thanked her and told her he was applying to study at Tel Aviv University. She then replied to say that she couldn’t provide the reference, Secker said. 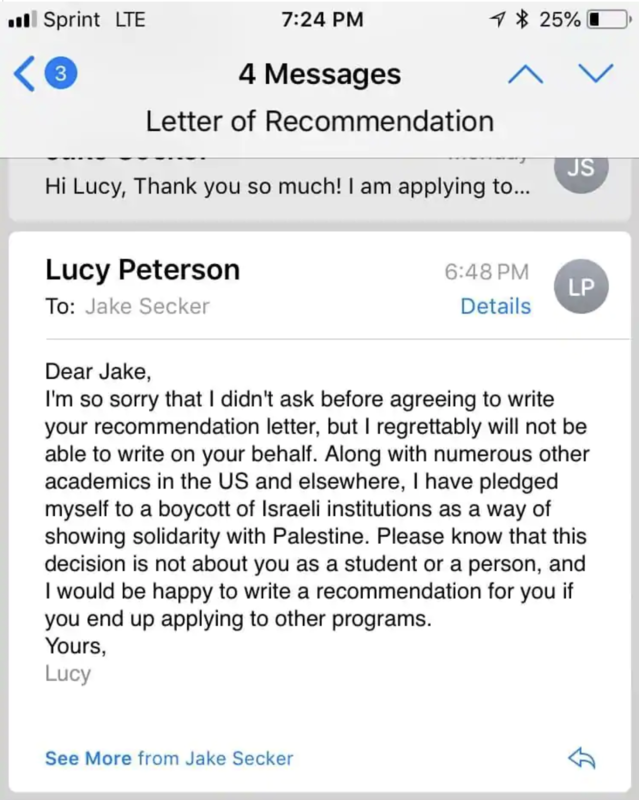 Again, this doesn’t reflect any problem with Jake Secker’s record, for Peterson was willing to write recommendations for other programs (as was Cheney-Lippold for the other student). This is purely about hatred of Israel, and an instructor’s unwillingness to do her job mentoring because she wants to “show solidarity with Palestine.” It’s a second case of abnegation of duty in favor of politics, and it’s wrong. The Post article adds that Secker contacted Hillel and then his complaint went to the UM Board of Regents and the President of UM. The associate dean for social sciences also wrote a kindly and supportive letter to Secker, offering to meet with him. The dean then offered to write the letter of recommendation herself (that would be a weighty letter!) and said that there would be “some sort of change.” Secker’s father also contacted the UM President and said that there should be disciplinary action against Peterson. I’ll probably write a letter or two supporting Secker, without recommending that Peterson be disciplined or fired. After all, she’s a graduate instructor, which probably means a graduate student who is doing teaching, and that has to be taken into consideration. But Peterson also needs a trip to the woodshed. The anti-Israel BDS movement (“boycot, divestment and sanctions”) is an immoral boycott, since it mainly pressures “soft targets” like scientific, academic, and cultural exchanges, and other civilian activities unrelated to Israeli legal policy. But I disagree with Israel’s stance that they have the right to totally control who enters their borders. I believe in the right to move as a basic human right, that includes the right to study and collaborate across borders. It is for precisely the same reason that I condemn BDS that I have to also condemn Israel’s response to it. Alqasem, whose father is of Palestinian heritage, was refused entry to the country on the basis of a law barring foreign nationals who publicly back or call for any kind of boycott against Israel. I can appreciate the irony of it being an American being denied crossing someone else's border for a change.